As the world’s financial systems crumble about our ears, it may be a good time to reflect on the perils of automatic trading. For all the rules and safeguards in all the stock exchanges of the world, isn’t it just possible that in a quiet office in London, or New York, or Geneva, a genius mathematician has developed an algorithm so smart that it can get out-game the electronic stock exchanges, so fast and complex even its designers can’t keep up with it, and so amorally reckless, that it would do literally anything to make a buck? Of course it is, and that’s why the premise of The Fear Index by Robert Harris is seriously creepy. The novel is self-consciously a Frankenstein story—the quote from Mary Shelley at the top of Chapter One gives that away—but the “monster” is refreshingly credible, and author Harris’s “Dr. Frankenstein”—a genius mathematician, Dr. Alexander Hoffmann—has no intention whatsoever of creating life. Hoffmann has been working at CERN on a physics problem, building an artificial intelligence on the side. To give his learning algorithm something meaty to chew on, he programs it to work the stock market—where it earns enough to pay for Hoffmann’s hobby. When a hedge fund manager called Hugo Quarry discovers Hoffmann and his little project, the pair team up and take it to a whole new level. They build a multibillion-dollar hedge fund, making themselves and their investors very rich. But Hoffmann is not really interested in the money, he just wants to keep on improving his AI, and now he has all the money he needs and a team of analysts to help him. That the project goes off the rails goes without saying. The “positions” the algorithm takes in the market become more extreme, but also more successful. At the same time, Hoffmann finds himself targeted by a deranged killer, bank accounts he didn’t know he had are being used to make incriminating purchases, and a market collapse no-one had foreseen is successfully predicted by the algorithm after a terrorist attack on a commercial flight. Pretty soon, Hoffmann is on the run from the police, trying to clear his name and save his marriage, while at the same time trying to understand what his own software is up to. Yes, it’s a well-worn plot and, yes, several of the characters are exactly what you’d expect—the head-in-the-clouds genius, the provincial but sharp policeman, and so on—but this is not a piece of hack work. The writing is good and the story is freshened by three things: Hugo Quarry, the protagonist’s friend and partner, who is an interesting and believable character; the accurate and credible depiction of the complex world of derivatives trading; and the “monster” itself. The AI at the root of all Hoffmann’s troubles is one of the most intelligently drawn software creations you are likely to come across. It doesn’t talk; it doesn’t display any emotion; it isn’t trying to conquer the world or impregnate the beautiful heroine; it just does what it was built to do: make money. And while it is never at the front of stage until the end of the book, we feel its menacing presence on every page. 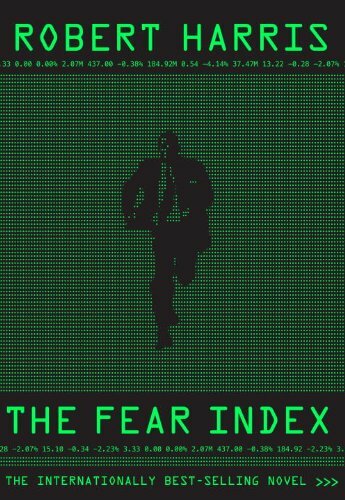 The Fear Index is a solid, competent techno-thriller, carefully researched and intelligently executed. If you enjoy this genre—and who doesn’t now and then?—put this one on your to-be-read list.